Desiree Fairooz was convicted of disrupting the Attorney General’s hearings. Update: 3/5/2017, 3:34 p.m.: The New York Times has reported that Desiree Fairooz has been convicted of two charges: disorderly conduct and parading or demonstrating on Capitol grounds. Tighe Barry and Lenny Bianchi were convicted on charges of parading or demonstrating. Fairooz said she was "really disappointed" in the verdict and plans to file to have the verdict set aside through a post-trial motion. Desiree Fairooz, a 61-year old Code Pink activist, was arrested on January 10 during the confirmation hearings of Senator Jeff Sessions for the position of attorney general. 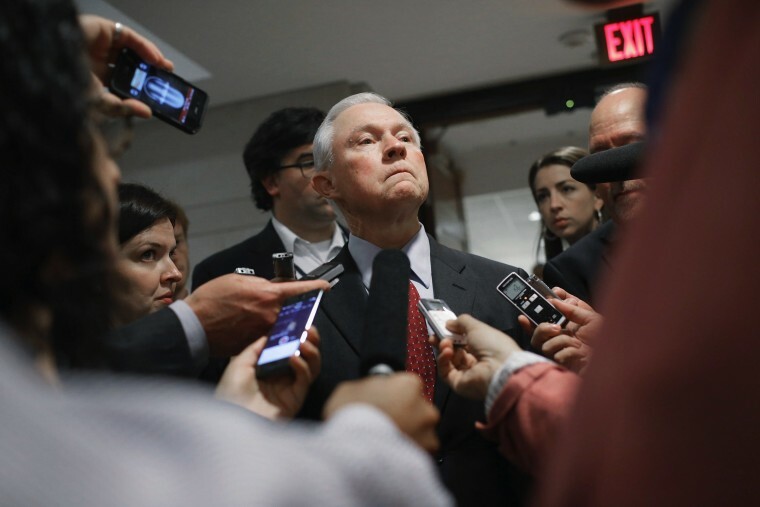 Fairooz had laughed when Senator Richard Shelby said that Sessions has a strong record of “treating all Americans equally under the law," and today, The Huffington Post reported that Fairooz is being prosecuted for her laugh. The government asserts that Fairooz's laughter constituted “disorderly and disruptive conduct.” Fairooz's defence insists that her response was a reflex. If convicted, she could face up to six months in jail and a $500 fine. She also faces a separate misdemeanour charge for "for allegedly parading, demonstrating or picketing within a Capitol." Jeff Sessions's confirmation hearing was consistently protested by various groups. Members of the NAACP were arrested for a sit-in, and Senator Elizabeth Warren was silenced by Senate Republicans for reading from a letter written by Coretta Scott King. The letter, penned by King in 1986, was credited for sinking Sessions's nomination by President Ronald Reagan for a federal judgeship. In 2007, Fairooz confronted then-Secretary of State Condoleezza Rice with bloodied hands in protest against the Iraq War. Fairooz is on currently trial alongside Tighe Barry and Lenny Bianchi, two activists who dressed up as KKK members "supporting" Sessions. Since President Donald Trump's election, Republicans in at least 18 states have passed or contemplated anti-protest laws. Watch video of Fairooz's removal, which occurred after her laugh, below.